Wow what a major flashback! 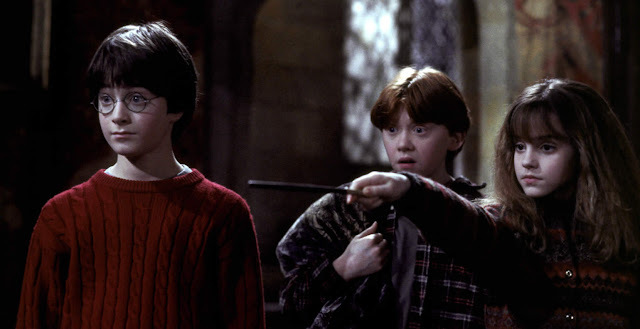 The first movie I've ever watched on theater was Harry Potter and the Sorcerer's Stone (2001). I was 9 years old back then, very excited to see the magical world of Hogwarts on the big screen with my brother and his girlfriend (now they're married couple with two kids). I had to say my first experience was really great. First time went to theatre and I watched the most magical movie (saga) ever. I grew up with Harry, Ron and Hermione. I grew up with them through the movie, although I just read the whole book when I was 13 or 14. This movie has a special place on my heart. I learned so much from this movie - to stand up for myself, to always be kind, to be brave and of course, to appreciate what I already have. I can't count how many times I've watched this and other movies, honestly. I lost of it, lol. But you know, if you're a big fan of Harry Potter, you'll understand how much it means to you.